One hundred people quite deliberately headed toward Savannah, Tennessee in spite of extreme rainfall, flooding, and violent weather. They were drawn to the Savannah Area Beekeepers Association’s sixth annual Short Course in Beekeeping. One person, however, a businessman, Paul Durr, braved the weather to attend the meeting by accident. Mr. Durr misread the announcement in the local newspaper. Interested in furthering his business skills, he thought that he would be attending a bookkeeping course—not a beekeeping course. Once he arrived, Mr. Durr decided to stay for the day. He did, after all, have a long-time interest in honey bees, having shared his home with colonies of bees that have lived in the space above his ceiling for 40 years. Mr. Durr sat in on beekeeping sessions throughout the day. I had the honor of giving the keynote presentation, introducing the new beekeepers to the history of the beekeeping craft by tracing the tradition of beekeeping from its honey-hunting roots with our cave-dwelling ancestors. Training sessions were conducted by invited speakers and talented Savannah beekeepers. Dr. Jeff Harris from Mississippi State University, renowned for identifying honey bees with the Varroa Sensitive Hygiene trait, spoke on developments in breeding parasitic mite tolerant bees. EAS Master Beekeeper Kent Williams described measures for increasing honey production, and Trevor Qualls taught the new beekeepers how to install packages of bees into their hives. 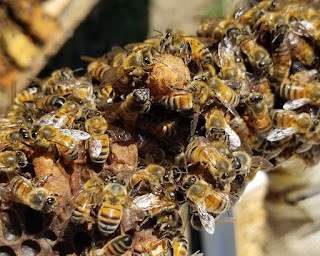 Other speakers described the bee hive equipment, methods of feeding bees, catching swarms, and what to expect in the first two years of beekeeping. Conducting a random drawing, “Coach” Lynn Wood, the Tennessee Beekeepers Association’s Regional Vice President, awarded three bee hives to new beekeepers. Mr. Durr was drawn as a hive winner. He was surprised to end his day becoming an unexpected beekeeper. His greater surprise came in learning that “Coach” Wood remembered teaching him years earlier in high school. Today’s photo: TVA releasing two million gallons of Tennessee River floodwater per second at Wilson Dam, Florence, Alabama. Whenever I encounter evening primrose plants in bloom, I watch them for a while. These native plants attract a variety of bees and other pollinators. At night, evening primrose is highly attractive to large moths. In the early hours of the morning, fast flying blue orchard bees visit the yellow flowers. Later in the day, butterflies, honey bees, flies, and other insects actively forage evening primrose. In today’s photo a honey bee collects nectar from evening primrose. Honey bees can detect differences in nectar sugar concentrations of one to three percent, and foraging worker bees seek those nectar sources with the greatest concentrations of sugars. Lilach Hadany, a researcher at Tel Aviv University, questioned whether plants could hear sounds similarly to animals, https://www.nationalgeographic.com/science/2019/01/flowers-can-hear-bees-and-make-their-nectar-sweeter/. Hadany’s findings reveal that at least one plant, evening primrose, responds to the vibrations of pollinators’ wings. Within minutes of exposure to vibrations in the range of honey bee wing beats (0.2 to 0.5 kilohertz), evening primrose increased the concentration of sugars in its nectar. Hadany’s lab found that within three minutes of exposure to honey bee wing-beat-frequency vibrations the plants increased the nectar sugar concentrations from between 12 and 17 percent to 20 percent. In field observations, her researchers found pollinators around evening primrose plants nine times more frequently after the plants were visited within the past six minutes. The resulting sweeter nectar is naturally more attractive to bees and other pollinators. Since flowering plants, such as evening primrose, depend upon insect pollination for reproduction, any plant that attracts more pollinators has a reproductive advantage. Evening primrose flower petals are shaped like an open bowl. Such shapes concentrate and increase vibrations. The researchers at the Tel Aviv lab found that evening primrose flowers concentrated vibrations of the frequency range of honey bees. The ability of a flowering plant to increase its nectar’s sugar concentration would make it more attractive to pollinators and more likely to be pollinated, the first step in the plant’s reproduction.